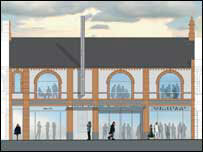 Artists' impressions of a new cinema for the community of Prestatyn have been revealed for the first time. Plans for the old Scala cinema include pulling down the old white and blue facade to make way for elegant arched windows. A community room, studio for theatre use, visual arts gallery and cafe bar are included in the scheme for the old Victorian landmark. "It's exactly what I wanted," said campaigner Sandra Pitt. "All the public want is for it to go-ahead. "That's the only message they want putting forward. "Everybody was thrilled apart from one lady who wants a raised stage," she added. A business plan - and funding options - are now being worked on by consultants for Denbighshire Council. The next step will also include a planning application. 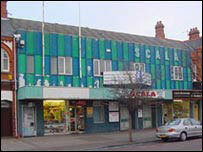 Mrs Pitt, from the Scala Advisory Group, said the new building will blend in perfectly in the High Street. Three years on from its closure due to structural problems, interest in the Scala has been huge. "The town was in uproar when it closed," said Mrs Pitt. "Quite a few went to the public meeting and a lot of people signed the comment books - the comments were good," she added. Mrs Pitt hopes the new Scala can open in around 18 months. She has had a long association with the cinema. She was barred briefly there as a student during the 1960s and her daughter Melanie worked there as a projectionist. "It wasn't just a cinema, it was the hub of a community," said Mrs Pitt. "Children's parties were held there and the historical society met there," she added. Mrs Pitt also remembers the friendliness of the old Scala. "If it wasn't too busy in the cinema everyone would have a cup of tea. "We hope even though it's a new building we can keep that spirit. "Women were not afraid to go there on their own. "People used to bring their children on a Saturday morning show and leave them there and Mel and Gwyneth would look after them. "Although we used to go to the cinema, it was more of a community centre than anything else," she said. Councillor Mike German recalled going to the cinema as a young boy. "I can actually remember being carried on my father's shoulders coming home from the cinema and stopping for a bag of chips on the way home," he said. "The whole family used to go the pictures." Coun German said he hoped film-maker and cinematographer Saronie, who put on many films at the Scala, would be remembered in the new building.